Meet two popular characters: The Professor and The Brain. Dozens of Ann Arbor students count the duo among their closest of summer pals. You’ll find them at elementary school playgrounds and community centers around Ann Arbor, where they’re busy keeping students in touch with math, reading and writing skills as part of the ThinkStretch eight-week summer learning program. At Carpenter Elementary School, this is the second year the Professor and The Brain have come to the playground where parents are using the ThinkStretch workbooks to teach with fun events such as math games and scavenger hunts for students in kindergarten through grade 4. Ann Judge and Alan Tanabe coordinate the twice-weekly playground study that includes bookwork study, then a game and prizes at the end. All students get the ThinkStretch books and anyone is welcome to come out for the playground time. 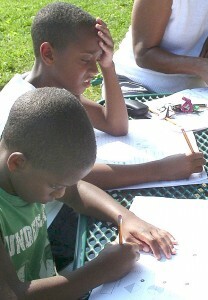 Carpenter Elementary students work on ThinkStretch math during a summer playground morning. When finished, students took part in a scavenger hunt, with prizes. ThinkStretch started out as a PTO project at Haisley Elementary School three years ago to help students maintain their level of learning throughout the summer. Lasinski, who is also active on the PTO Council board and with the group’s Advisory Committee on school funding, said she became concerned as a Haisley mom when she read the research. Working at her kitchen table, she methodically began looking at what teachers were doing at each grade level and found that all had unique approaches. 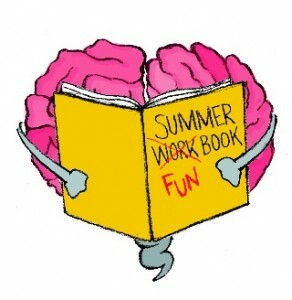 Taking lessons and standards for each grade, and with input from teachers, she formulated workbooks that could be used schoolwide during the summer months. Via word of mouth, other Ann Arbor schools requested the program, so Lasinski standardized it, named it ThinkStretch and worked with local graphic designers at Quack! Media to develop unique characters (Professor and The Brain) and print professional workbooks. Although Lasinski is reserved about promoting the program, she is not shy about sharing what happens when students continue learning over the summer months – and what happens when they don’t. “Many parents don’t understand that kids really do lose over the summer,” she said. Citing a study from the National Center for Summer Learning at Johns Hopkins University, she said most of that learning loss takes place at the elementary school level, so that student losses “equate to 18 months in verbal skills by the end of fifth grade,” she said. Children lose between 1-2 months of math skills over the summer and between 1-3 months of reading skills, Lasinski said. 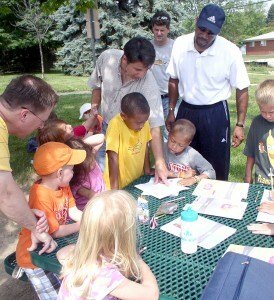 Parents help Carpenter Elementary students complete a math problem as part of a playground activity. The ThinkStretch program is taking place this summer for students from Carpenter, Burns Park, Allen, Bryant, Pattengill, Haisley and Lawton. For some students, such as those who attend Haisley, the program is being conducted for the area at the Peace Neighborhood Center so more area children have access to it, Lasinski said. The program includes a parent orientation, summer study booklets as well as a fall honors program where students receive medals for their effort – bronze, silver and gold, depending on how much of the book they complete. For Ann Arbor schools and PTOs, Lasinski charges $8 per pupil, which covers her costs. The program must be used by an entire grade level, or throughout a school; she does not sell books to individual parents. Districts outside of Ann Arbor are charged $10, she said. In Ann Arbor, the program is funded mainly through PTOs, with some funding coming through the AAPS Educational Foundation. She said the ThinkStretch program is designed simply and is designed to be age-level appropriate with little supervision. “This can be done with a book and pencil,” she added. You can find more information about ThinkStretch on the Web or by calling 734-997-7265.